I am a 69 year old theatre-maker currently living in Leeds. In 2014 I formed my own company, The Performance Company, an ensemble theatre company of performers aged 60 years and older. We work with artists and performers from various cultural backgrounds; creating contemporary theatre for audiences of all ages. The Ensemble blurs the divide between community and professional arts. We aspire to create world class theatre performance that emerges from the heart of communities. Considering life through the lens of contemporary old age is a truly radical act. It reframes values and debates. It repositions individuals in relation to society. Time shifts. Legacy rather than career comes into play. It is not a time for living in the past or the future but living fully in the moment. Perhaps “old” is measured by a yardstick of loss. A loss of mobility, a loss of ambition, a loss of connectedness. The loss of friends and family members. A loss of muscle tone, a reduced of sharpness of vision, a blurring in hearing, a fuzziness in thinking, some change in clarity. Yet that’s only half a story. We have collected. We have gathered. We have seen, we have listened, recorded and we have understood. We are the experts of our own experience and became so simply by continuing. We embody the extended past in the present. We are the living libraries of our own knowledge. A couple of years ago I was doing some story telling workshops for the ‘Young at Arts’ programme in Rothwell. One of people in the group, Margaret, told me a story about how sometimes she felt a little depressed and lonely. But she didn’t give into that feeling and she would take her bus pass and get on a bus and set off on a small adventure. She would see some familiar places and some new. But she always met somebody on the journey and got into conversation. She described one beautiful trip to Howarth, the Pennine village where the Brontë family lived and wrote. It got me thinking. Shortly after this workshop Leeds City Council put out a call to artists and arts organisations to propose a project for their bid to become European City of Culture in 2023. I put forward a project inspired by Margaret’s story called ‘Bus Pass. It was accepted. ‘Bus Pass’ will involve performance on 16 double-decker buses (4 travelling north, 4 east, 4 south and 4 west). The buses will stop off at seven sites across the city where they will see spectacular events, in tunnels, through parks, to landmarks and urban spaces. Each bus will see all events but in a different order. The 16 buses will return to a central location together (in convoy) where they will see the finale involving hundreds of older performers. Just before Leeds City Council was about to submit their plans, the European Union told the British Government that UK cities were no longer eligible to apply for European City of Culture status as we were leaving the European Union. It was a blow, but the enterprising council decided they would go ahead anyway with a festival of their own in 2023 and they committed themselves to raising the necessary funding to support the festival. We, at The Performance Ensemble, also decided that we would continue with our project. It is a big project and needs a lot of planning, creating partnerships with organisations and relationships with thousands of older people across Leeds. I believe it will take five years to put it all together, which is why we are starting in this summer with ‘Bus Ride’. ‘Bus Ride’ will culminate in a performance at The Queen’s Hotel Ballroom at 5pm on September 16th this year. 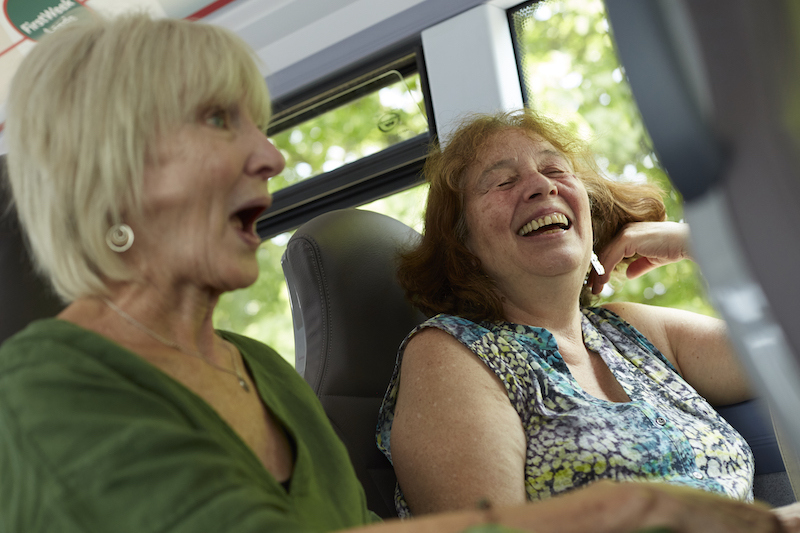 This summer we have invited 50 volunteers to connect with 50 older people, who are, maybe, feeling a little isolated and accompany them on a bus journey. They will have conversations, listen to stories, get to know each other and share a meal or a cup of tea. We will record and edit the stories and conversations and publish them on our web site with photographs of each journey. 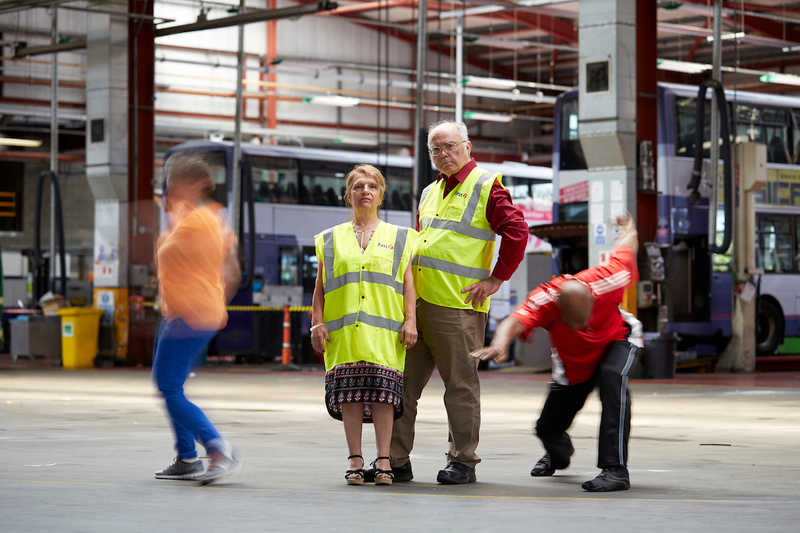 The performance, ‘Bus Ride’ will be created from the material we gather on the bus journeys. The participants presenting themselves becomes the central text of the work; their stories, their concerns, their aspirations. It is based on the belief that the telling and listening to stories from people is an act of generosity. It will lead us to a performance full of dance, music, stories and songs. Moments of life as lived by older people. This first step has been made possible by support from Time to Shine, Leeds Inspired, Arts Council England, Leeds 2023 and Leeds Playhouse. We are very grateful to them. Guerrilla: just let go and dance!